Treasure Chamber is a room in Bowser's Castle during the events of Mario & Luigi: Bowser's Inside Story. Bowser comes here to find the 2nd Star Cure before Mario. He does get here before Mario, and sees a giant railroad track in the middle of the room. When Bowser walks up to the track, Private Goomp, Sergeant Guy, and Corporal Paraplonk enter the room. After they enter, a train driven by the Monty Bros. slams into Bowser. Bowser, mad at the treachery of the Monty Bros, attacks them, but they dodge and use the train to slam Bowser into a rock. 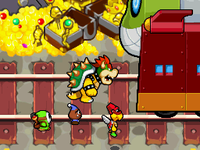 Bowser eventually fights the train in giant form and opens a safe in his Treasure Chamber. Once the safe is opened, his three minions push Bowser in the safe, for Fawful's reward (implied to be an increase in food due to them mentioning extra rations). According to Bowser in the Bowser Brain Train quiz, the contents of the Treasure Chamber had been filled by Bowser "taking [it] by force" beforehand. This page was last edited on January 12, 2019, at 15:34.